This is the twelfth in a series of blog posts about recovering from the Gulf oil spill and from oil dependency overall. The first introduces the series. Among ideas for recovery -- from the Gulf spill, from oil addiction, from our economic doldrums – more investment in transit is near the top of the list. Now here’s another suggestion to layer in: make this free transit – with no fare charged at the point of use. Before you scream “socialist idea!” and dismiss the concept out of hand, consider that every airport with a tram or people-mover already offers free transit. In other words, we already have circumstances in which free transit is considered widely appropriate and even taken for granted. Prominent examples of free transit exist outside of airports, too. Portland, Oregon has a long-established “Fareless Square” in its downtown core which currently provides free rides on all rail services, including TriMet’s MAX Light Rail system and Portland Streetcars, within a designated “Free Rail Zone.” This aids air quality and provides people with easy transport in Portland’s downtown – which is also walkable and bike-friendly – as well as saving valuable downtown real estate for purposes other than parking. In Belgium, the city of Hasselt operates a model free transit system. When the city decided to provide free transit instead of expanding its road system, transit ridership went up an incredible 800 percent, and continued to climb from there. In conjunction with more walking and bike paths, this reduced congestion, lessened traffic deaths, attracted business, and even saved enough money that the town could cut taxes. Closely related to free transit is the idea of low-fare transit. For instance, the Santa Barbara Metropolitan Transit District’s Downtown-Waterfront Shuttle, an open-air electric bus that serves Santa Barbara’s State Street and waterfront, costs only 25 cents. These shuttles run as frequently as every 10 minutes during the summer and help make Santa Barbara spectacularly easy to visit without a car. In Britain, according to a report by Bob Jeffery, low transit fares in the town of Sheffield actually reduced the level of car ownership; however, when the low fares increased, this trend reversed. 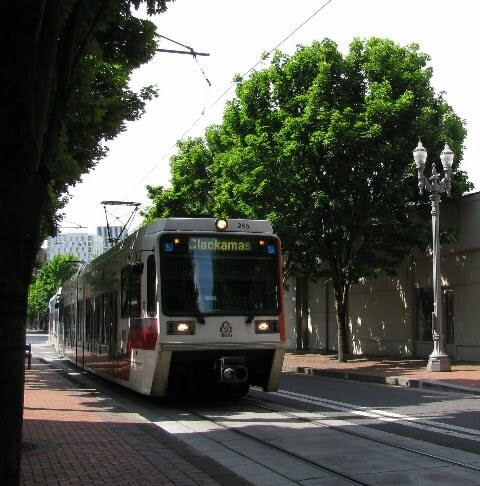 Transit is a public good akin to a street or sidewalk. It has a range of societal benefits, not only providing mobility in a more egalitarian manner than do private automobiles, but also reducing oil dependence and providing jobs. In fact, as I pointed out in Divorce Your Car! (p. 166), studies have shown that investment in transit creates more jobs, dollar for dollar, than building roads. Transit, by the way, also helps people lose weight – seriously! -- and I hope to have more to say about that tomorrow. The Gulf oil disaster ought to show us that getting off oil is critical enough not only to vastly increase investment in transit, but also to take a serious look at making it free. For more information about free transit, check the Free Public Transit website.